CopyTo Synchronizer is the free software which is designed to Synchronize and back up your files easily. This software easily synchronize files between a desktop PC and a notebook PC, move files between the home and office with removable media, or update multiple computers on a network, with the multiple folder settings. As you synchronize files, you can filter certain filenames and exclude specified folders using wildcards. You can display a preview window and check for disk space before you start the copying process. You can save and recall settings that you enter into CopyTo using the CopyTo project file, which have the “.cp2″extension. You can start synchronizing using the settings in the project file by double-clicking. 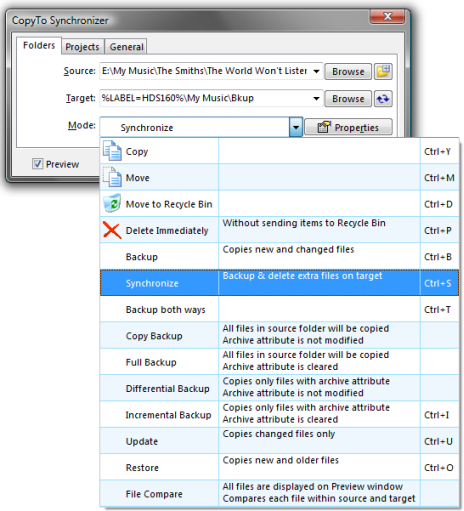 This freeware integrates itself into the Explorer and supports the zip file-compression. This program is ideal for those who want to save backups of important files or synchronize their PC data with another computer, even if there are better programs available. It offers a variety of kinds of backups, like Copy Backup, Full Backup, Differential Backup, Incremental Backup, File Compare. They have added windows vista and windows 7 support. Give it a try and share your feedback with us.